As I write this, it is Saturday morning, 2 December 2017. The sun has yet to rise. I have yet to put on pants. Nonetheless, I’m staring at the release notes for iOS 11.2, a significant update of iOS that Apple released overnight. Despite the company’s penchant for opening pre-orders at the absurd hour of midnight Pacific time, Apple usually releases software updates, at least for those of us in the United States, on a weekday, while it’s light out. Just before I fell asleep last night, news broke of a terrible bug affecting Australian users. As the clock struck midnight and the date changed to 2 December 2017 down under, Australian iPhones started rebooting. And rebooting. Every few seconds or minutes, affected iPhones rebooted again. Reddit users in /r/iphone caught on to the problem and quickly began suggesting solutions. The obvious solution, rolling back the clock, broke so many apps that it was not advised. The best alternative was to turn off third-party notifications. But the real fix is to install iOS 11.2. You can download the iOS 11.2 update either in Settings > General > Software Update or via iTunes — it’s about 430 MB on an iPhone X. We usually advise a waiting period before installing such large updates, but given Apple’s software quality problems this week, the better part of valor would seem to be to install it right away. We hope the iOS 11 quality assurance team did a better job on the 11.2 release than the High Sierra team did with the root vulnerability bug update. As for you, gentle iOS user, if your device is stuck in a terrible reboot loop, your best bet, per iMore’s Rene Ritchie, is to navigate to Settings > Notifications and disable all third-party notifications. That should stop the reboot loop. Besides preventing your iPhone from entering an infinite loop of reboot doom or turning your 24 into a 6, iOS 11.2 finally brings us Apple Pay Cash, the now-official name for Apple’s person-to-person Apple Pay feature. Well, it sort of does. It wasn’t available at release, and as of 4 December 2017, there is (sometimes) a switch to enable it in Settings > Wallet & Apple Pay, though it doesn’t seem to be functional yet. Apple Pay Cash would undoubtedly be the top story if not for this reboot bug. 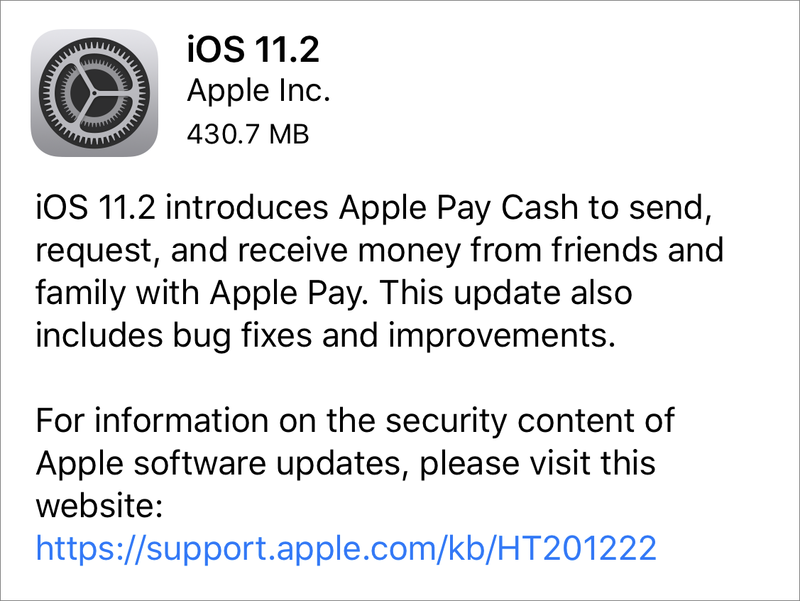 Our condolences to the Apple Pay Cash team for having their feature release overshadowed by a bug fix. We plan to have in-depth coverage once Apple enables it. iOS 11.2 also adds support for faster Qi “wireless” charging for the iPhone 8, 8 Plus, and X, if you have a compatible charger. These devices push out 7.5 watts of power, as opposed to the typical 5 watts. The update also adds three new live wallpapers for the iPhone X. You can find them in Settings > Wallpaper > Choose a New Wallpaper. In the Podcasts app, you can now swipe up while playing an episode to see a sleep timer, episode description, chapters, episode notes, and Up Next. On the accessibility front, iOS 11.2 adds support for real-time-text phone calls for the deaf and hard of hearing. Closing out the list of new features, HealthKit now supports downhill snow sports. Also, iOS 11.2 improves video camera stabilization. Right now, it’s great to see Apple improving any sort of stability. Sorry, couldn’t resist. Apple hasn’t yet published a list of security updates for iOS 11.2, although they should appear soon on the Apple Security Updates page. That team must have had the weekend off. Kudos to Apple for moving up iOS 11.2 release schedule to help affected users, but this is yet another nasty bug that Apple’s testing should have caught and fixed sooner. It doesn’t help that it reared its ugly head the same week as a security hole the size of Texas was found in macOS 10.13 High Sierra, and the first update to fix that problem broke file sharing (see “Apple Pushes Updates to Block the Root Vulnerability Bug,” 30 November 2017). And it hasn’t even been a month since the iOS bug that autocorrected the letter “i” to the letter “A” followed by a question mark in a box (see “Me, Myself, and A⍰,” 7 November 2017). Something is clearly rotten in the state of Denmark, by which I mean Apple’s quality assurance department. Many long-time TidBITS readers have been complaining for years about Apple’s declining software quality. Major missteps like these give Apple a black eye and, when they affect tens or even hundreds of millions of users, cause a significant waste of the world’s time. "…loginwindow Month 13 is out of bounds"
11.2 apparently fixed a charging issue on my iPad Pro. Suddenly yesterday I could not get 100% charged. I maxed at 95%. I kept it plugged into outlets hoping. I shut off most everything in background refresh. Then 11.2 came out and I achieved 100% as usual. Apple didn’t “fix the reboot loop so quickly”. They just pushed out the next version early, which didn’t exhibit the problem. They didn’t “quickly” do any work to “fix”anything! A good point - I'll reword. Nonetheless, Apple changed its plans to release ahead of schedule to address the problem, which was the right thing to do. > Right now, it’s great to see Apple improving any sort of stability. Thanks for the laugh. After this week, that’s exactly what I needed. Big thumbs up to you, Sir. Any word on changes to Bluetooth with this update? I’ve been having intermittent Bluetooth connectivity issues with my car (drops the connection for a few seconds at random times) and I can’t determine if it’s an iOS 11 issue or an an iPhone 8/Bluetooth 5 issue. From the Apple discussion forums, it’s unclear—some people claim that it also happens with the iPhone 7–but people have stated that Apple has responded to them that it is a Bluetooth 5 issue and that the car manufacturers will need to do a firmware update. I’m hoping that isn’t true because my car is 8 years old and it is highly unlikely that the manufacturer will release an update. I have also been having a dropout problem in my 2013 Audi. Whatever I was listening to (typically a podcast, on my iPhone 6s running iOS 11.0.3) when I turned off the car will come back on when I restart the car. But within a minute or so, silence. If I keep driving and do nothing, the show resumes two or three minutes later. I have a one week old iPhone 8 Plus running iOS 11.1.2, and when I bought it T-Moblie were selling Belkin Qi charging pads for $20 (50% discount) so I bought one. When my iPhone reaches 100% charge, the charging pad is meant to go to a solid green light, but instead the light keeps blinking indicating it's charging, AND the indicator on the phone - the lightning symbol stays lit indicating the phone thinks it's still charging. Belkin's site contains some comments that say the phone has to support full battery communication for the green light to change to solid. 1 - does anyone else see this same behaviour? 2 - does iOS support "full battery communication"? 3 - is 11.2 likely to have fixed this? After about 6 hours overnight, the Belkin pad's light was still blinking, indicating it was charging, and the lightning icon on the phone was showing, indicating that the phone thought it was still being charged, even though after 6 hours it would have been well and truly charged - it said 100% beside the icon. I updated my iPhone 6s to IOS11.1.2 but my phone has been shutting down and restarting randomly asking for my passcode. I have done hard reset and disabling all 3rd party applications notifications but still same. My battery drains. off as a result of this. Any help?? You need to update it to iOS 11.2 ASAP. If you can't do an OTA update, try iTunes. I had a problem with my AT&T voicemail that may or may not be related to the update, but the timing is suspicious. Sometime over the weekend when I would try to connect with my voice mail it started asking for my password. Not having any idea what it was, I called AT&T to have them reset the password. After the reset the voicemail was not setup. I tried three different ways and it always said it was not setup and then hung up on me with no way to setup anything. On my fourth call to AT&T, numerous iPhone resets and code pushes they finally got it back up. However it erased all of my unread voicemails. Anybody else see this or am I uniquely lucky? Re the delayed security info: a likely explanation is that many of the same security fixes are in iOS 11.2, tvOS 11.2, watchOS 4.2 and macOS 10.13.2, and Apple is responsibly not disclosing what was fixed in iOS 11.2 until the other three OS updates are available. tvOS was released on Monday morning (PST) but it looks like watchOS and macOS will be Tuesday or later. That is better than Apple's past habits, e.g. iOS 8 and OS X Yosemite had some of the same security fixes but were released a month apart, and the security fixes in iOS 8 were documented on its release. I would place it higher in the food chain. It's hard to avoid the impression that there's something seriously wrong at the top levels in Apple between macOS and iOS 11. Cook clearly banked on Ives to provide vision for the company, perhaps a hope that a legacy of Steve would endure somehow, and gave him the power to envisage the future of software as well as hardware. Aint' happening really. It may be the people Ives has surrounded himself with, it may be relationships internally in management, but the cogs are not joining up. A few more words about 'the loop'--my personal experience. Since my phone was 'looping' permanently--and the battery was draining scaringly fast (15% down in 5 minutes)--I just couldn't make the update, either on the air or through iTunes, some required transactions between the phone and Apple's servers or iTunes not completing. So my only option was to 'restore' the phone, which I did with iTunes and, happily enough, after making sure the 'looped' iPhone had a consistent back-up (I lost only two text messages in the process). Maybe it's just an idea: right now my iPhone 6 (well, yes, it's an old one...) seems more 'responsive'.